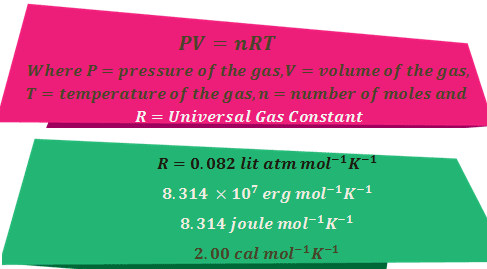 A gas at equilibrium has definite value of Pressure(P), Volume(V), Temperature(T) and Composition(n). These are called state Variables and are determined experimentally. The state of the gas can be defined by these variables. Boyle's(1662), Charles's(1787) and Avogadro laws gives the birth of an equation of state for Ideal Gas. When n and T are constant for a gas. When n and P are constant for a gas. When P and T are constant for a gas. Where R is the Universal Gas Constant. This is called ideal gas equation of state for ideal gas. This equation is found to hold most satisfactory when P tense to zero. At ordinary temperature and pressure, the equation is found to deviated about 5%. At NTP 1 mole gas at 1 atm Pressure occupied 22.4 lit of gas. So, erg = dyne cm2. Thus, the dimensions of R are energy per mole per kelvin and hence it represents the amount of work or energy) that can be obtained from one mole of a gas when its temperature is raised by one kelvin. M = Molar mass of the gas. We know that, Density (d) = Weight (g)/Volume (V). Where N = Number of molecules present in the gas and N₀ = Avogadro Number. Determine the value of gas constant R when pressure is expressed in Torr and Volume in dm3. Derive the value of R when, (a) pressure is expressed in atom, and volume in cm3and (b) Pressure in dyne m-2 and volume mm3. Find the Molar mass of ammonia at 5 atm pressure and 300C temperature (Density of ammonia = 3.42 gm lit-1). What is the molecular weight of a gas, 12.8 gms of which occupy 10 liters at a pressure of 750 mm and at 27°C ? Calculate the pressure excreted on the walls by ideal gas of a 3 litre of flask when 7 gms of nitrogen are introduced into the same at 27°C. Calculate the number of molecules present per ml of an ideal gas maintained at pressure of 7.6 × 10-3 mm of Hg at 0°C. After knowing the experimental gas lows, it is of interest to develop a theoretical model based on the structure and properties of gases, which can correlated to the experimental facts. Fortunately such theory has been developed for Formulation of Kinetic Theory of Gases based upon the certain postulates which are supposed to be applicable to an Ideal Gas. The gas is composed very small discrete particles, now called molecules. For a gas the mass and size of the molecules are same and different for different gases. The molecules are moving in all directions with verity of speeds. Some are very fast while other are slow. Due to random motion, the molecules are executing collision with the walls of the container (wall collision) and with themselves (inter molecular collision). These collision are perfectly elastic and so there occurs no loss of kinetic energy or momentum of the molecules by this collision. The gas molecules are assumed to be point masses, that is their size is very small in comparison to the distance they travel. There exist no inter molecular attraction specially at law pressure, that is one molecule can exert pressure independent of the influence of other molecules. The pressure exerted by a gas is due to the uniform wall collisions. Higher the frequency of the wall collision greater will be the pressure of the gas. This explains Boyle's law since when volume is reduced, wall collision becomes more frequent and pressure is increased. Through the molecular velocity are constantly changing due to inter molecular collision, average kinetic energy(є) of the molecules remains fixed at a given temperature. This explain the Charl's law that when T is increased , velocity are increased, wall collision become more frequent and pressure(P) is increased when T kept constant or Volume(V) is increases when P kept constant. Root mean square(RMS) speed is defined as the square root of the average of the squares of speeds. Let us take a cube of edge length l containing N molecules of a gas of molecular mass m and RMS speed is CRMS at temperature T and Pressure P.
N₃ have velocity C₃, and so on. Let us concentrate our discussion to a single molecule among N1 that have resultant velocity C1 and the component velocities are Cx, Cy and Cz. The Molecule will collide walls A and B with the Component Velocity Cx and other opposite faces by Cy and Cz. Similarly along Y and Z directions, the rate of change of momentum of the molecule are 2 mCy2/l and 2 mCz2/l respectively. = (2 mN₁C₁²/l)+(2 mN₂C₂²/l)+(2 mN₃C₃²/l)+ ..
Where CRMS2 = Root Mean Square Velocity of the Gases. According to the Newton's 2nd Low of Motion, rate of change of momentum due to wall collision is equal to force developed within the gas molecules. 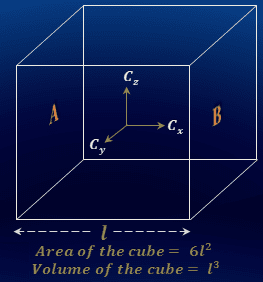 Here, l³ = Volume of the Cube Contain Gas Molecules. Where (mN/V) is the density(d) of the gas molecules. This equation are also valid for any shape of the gas container. 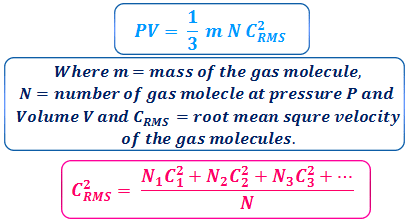 Let us apply the kinetic equation for 1 mole Ideal Gas.In that case mN = mN₀ = M and Ideal Gas Equation, PV = RT. Thus root mean square velocity depends on the molar mass(M) and temperature(T) of the gas. Ē = 1/2 m CRMS2. Where k = R/N0 and is known as the Boltzmann Constant. Its value is 1.38 × 10-23 JK-1. Thus Average Kinetic Energy is dependent of T only and it is not dependent on the nature of the gas. Calculate the pressure exerted by 1023 gas particles each of mass 10-22 gm in a container of volume 1 dm3. The root mean square speed is 105 cm sec-1. Calculate the root mean square speed of oxygen gas at 270C. We know that, CRMS2 = (3RT/M). Here, M = 32 gm mol-1, and T = 270 C = (273+27)K = 300 K.
Calculate the RMS speed of NH3 at N.T.P. and M = 17 × 10-3 Kg mol-1. How the root mean square velocity for Oxygen compares with that of the Hydrogen? That is CRMS of O2 = 4 × CRMS of H2. Calculate the kinetic energy of translation of 8.5 gm NH3 at 270C. Calculate the RMS velocity of oxygen molecules having a kinetic energy of 2 K.cal mol-1. At what temperature the molecules have this value of KE ? 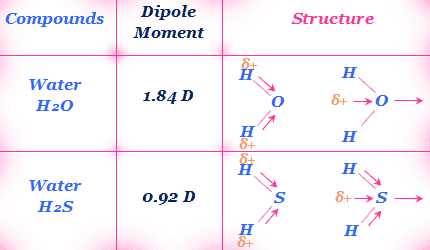 Different application of dipole moment are taken one after another. Let us consider a molecule A - B having the dipole moment μobs and the bond length l cm. if the shared electron pair lies at the midpoint of the atoms, the bond will be purely covalent and the present of ionic character is zero. But the dipole moment of AB is neither zero or nor μionic. At NTP, M/ρ = molar volume = 22400cc/mole and αi= r³ taking the spherical shape of the molecule. Hence, radius of the molecule r can be determined by measuring D൦ of the substance at NTP. The mono-atomic inert gases are non-polar and it indicates the symmetrical charge distribution in molecule. Heteronucler diatomic molecules are always polar due to difference of electronegativity of the constituent atoms. 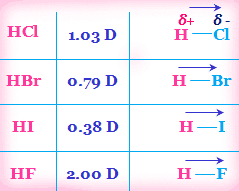 The example are , HCl, HBr, HF etc. this indicates that electron pair is not equally shared and shifted to the more electronegative atom. The molecules, like CO₂, BeCl₂, BeF₂, SnCl₂ etc have zero dipole moment indicating that the molecules have symmetrical linear structure. For example, CO₂ has structure, The electric moment of one C - O bond ( known as bond moment ) cancel the electric moment of the other C - O bond. The electric moment associated with the bond arising from difference of electronegativity is called the bond moment(m). In molecules, the vectorial addition of the bond moments (m) gives the resultant dipole moment(μ) of the molecule. Where, m₁ and m₂ are the bond moments. that is the molecule is linear. Another type of molecules such as, H₂O, H₂S, SO₂᠌᠌ etc. have μ ≠ 0 indicating that they have non linear structure. The bond angle can be calculated from the bond moments of the molecules. The molecules like BCl₃, BF₃ etc have dipole moment zero indicating that they have regular planar structure. 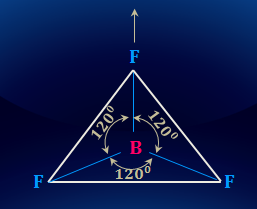 There halogen atoms are on a plane at the corner of the equilateral triangle and B atom is at the intersection of the molecules. The displacement of HCl is 1.03 Debye and its bond length is 1.27 A. calculate the (a) charge on the constituent atom and (b) the % of the ionic Character of HCl. The Difference between electronegativity of Carbon and Oxygen Is large but the dipole moments of carbon monoxide is very low - Why? However, in CO, there are large difference of electronegativity between C and O but the molecule is very low value of dipole moment. This suggested that the charge density in O-atom is somehow back-donated to C-atom. This explain by forming a coordinate covalent bond directing towards C-atom. H₂O molecule has a dipole moment-Explain. Does it invalidate a linear structure ? 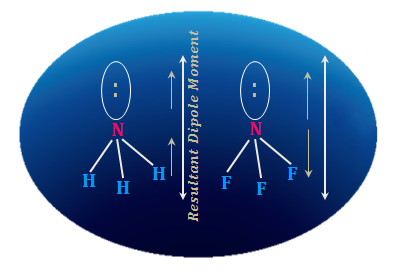 The contribution of non-bonding electrons towards the total dipole moment is included within the bond moment. We have, μ = 0.95 D and θ = 97°. Show that the bond moment vectors of NF₃ molecule adds up to zero. While other type of the molecule such as NH₃, PH₃, AsH₃ are polar (μ≠0) indicating that that the molecule have a pyramidal structure in which the three H-atoms are on the plane and N-atom at the apex of the pyramid in NH₃. But NF₃ has very small dipole moment though there is great difference of electronegativity between N and F atoms and similar structure of NH₃. Low value of μ of NF₃ is explain by the fact that resultant bond moment of the three N - F bonds is acting in opposite direction to that of the lone pair placed at the N-atom. But in NH₃, the resultant bond moment is acting in the same direction as that of the lone pair electrons. The rate at which a radioactive sample disintegrates can be determined by counting the number of particles emitted in a given time. Where N is the number of the atoms of the disintegrating radio-element present at the any time, dt is the time over which the disintegration is measured and k is the radioactive decay rate constant. 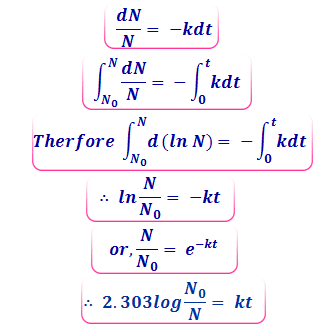 Thus, the rate constant(k) is defined as the fraction decomposing in unit time interval provided the conc. 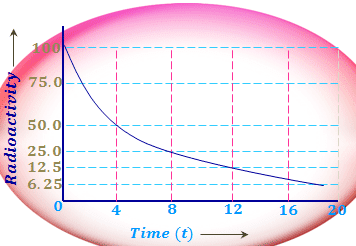 of the reactant in kept constant by adding from outside during this time interval. The negative sign shows that N decreases with time. Let N₀ = number of the atoms present at the time t = 0 and N = Number of atom present after t time interval. Rearranging and integrating over the limits N₀ and N and time, 0 and t.
After a certain period of time the value of (N₀/N ) becomes one half, that is, half of the radioactive elements have undergone disintegration. This period is called half life of radioactive element and is a characteristic property of a radioactive element. If a radioactive element is 100% radioactive and the half life period of this element 4 hour. Thus after four hour it decompose 50% and remaining 50%. The above relation shows that both the half-life and radioactive decay rate constant are independent of the amount of the radio-element present at a given time. ₈₄Po²¹³ has t½ = 4.2 × 10⁻⁶ sec, whereas ₈₃Bi²⁰⁹ is 3 × 10⁷ years. A method of determining the age of organic martial based on the accurate determination of the ratio of carbon-14 and carbon-12. carbon 14 is produced in the atmosphere by the interaction of neutron with ordinary nitrogen. The carbon-14 ultimately goes over to carbon-14 dioxide. A steady state concentration of one ¹⁴C to ¹²C is reached in the atmospheric CO₂ . This carbon dioxide is taken in or given out by plants and plant eating animals or human beings so they all bear this ratio. When a plant or animals died the steady state is disturbed since there is no fresh intake of stratospheric CO₂ the dead matter is out of equilibrium with the atmosphere. The ¹⁴C continues to decay so that there after a number of years only a fraction of it is left on the died matter. Therefore the ratio of the ¹⁴C/¹²C drops from the steady state ratio in the living matter. By measuring this ratio and comparing it with the ratio in living plants one can estimate when the plant died. A knowledge of the rate of decay of certain radioactive isotopes helps to determine the age of various rock deposits. Let us consider a uranium containing rock formed many years ago. The uranium started to decay giving rise to the uranium - 238 to lead -206 series. The half lives of the intermediate members being small compared to that of uranium -238(4.5 × 10⁹ years), it is reasonable to assume that those uranium atoms that started decaying many many years ago must have been completely converted to the stable lead-206 during this extra long period. The uranium-238 remaining and the lead-206 formed must together account for the uranium 238 present at zero time , that is, when the rock solidified. Thus both N₀ and N are known k is known from a knowledge of the half life of uranium -238. Therefore the age of the rock can be calculated. If 1 gm of a radioactive element contain N number of atoms. If each atom of the radio-element expels one particle then kN, the rate of decay, is also the rate at which such particles are ejected. Besides half life of a radio-element another aspect of the life of a radio-element must also be known. It is now possible to determine the average life period of a radioactive atom present in an aggregate of a large number of atoms. Average life period of an atom of the radio-element tells us the average span of time after which the atom will disintegrate. The length of time a radio-element atom can live before it disintegrates may have values from zero to infinity. Let N₀ atoms of a radioactive element are present in an aggregate of large no of atoms at time zero. Now in the small time interval t to (t+dt), dN atoms are found to disintegrate. Since dt is a small time period, we can take dN as the number of atoms disintegrating at the time t. So the total life time of all the dN atoms is t dN. Again the total number of atoms N₀ is composed of many such small number of atoms dN₁, dN₂, dN₃ etc, each with its own life span t₁, t₂, t₃ etc. The average life of Radio-element is thus the reciprocal of its radioactive disintegration constant. This result can also be derived in a very simple alternative way. Since the radioactive atoms may be regarded as having an average life, then the product of the fractions of atoms disintegrating in unit time (that is k) and average life must be unity. A piece of wood was found to have ¹⁴C/¹²C ratio 0.7 times that in the living plant. Calculate the approximate period when the plant died(t₁/₂ = 5760 years). A sample of uranium (t₁/₂ = 4.5 × 10⁹) ore is found to contain 11.9 gm of uranium-238 and 10.3 gm of lead-206. Calculate the age of the ore. Thus mole of uranium -238 present in the ore at zero time = (0.05+0.05) = 0.010 mole. = 0.154 × 10⁻⁹ yr⁻¹. Since radioactivity is a nuclear phenomenon it must be connected with the instability of the nucleus.We know that the nucleus of an atom is composed of two fundamental particles, protons and neutrons. Since all elements are not radioactive, the ratio of neutron to proton of the unstable, radioactive nucleus is the factor responsible for radioactivity. Nuclear scientist studied this problems and concluded that the stability or instability is connected with the pairing of the nuclear spins. Just as electrons spin around their own axes and just as electron- spin pairing leads to be stable chemical bonds, so also the nuclear protons and neutrons spin around their own axes, and pairing of spins of neutrons among neutrons, and pairing of spins of protons among protons leads to nuclear stability. Nuclei with even number of protons and even number of neutrons are most aboundent and most stable. It is observed that even number leads to spin pairing, and odd number leads to unpaired spins. Nuclei with even number of neutrons and odd number protons or odd number of neutrons and even number of protons slightly lees stable then even number of neutrons and protons. By far the least stable isotopes are those which have odd numbers of protons and odd number of neutrons. The nuclear spin pairing is a maximum when odd numbers of both are present. Along with the odd or even number of protons and neutrons, the nuclear stability also influenced by the relative numbers of protons and neutrons. The neutron/proton ratio (n/p) helps us to predict which way an unstable radioactive nucleus will decay. 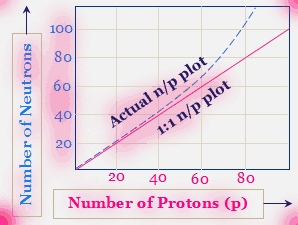 The above graph is obtained by plotting the number of neutrons in the nuclei of a the stable isotopes against the respective number of protons. A study of this figure shows that the actual n/p plot of stable isotopes breaks of from hypothetical 1:1 plot around an atomic number 20, and thereafter rises rather steeply, this indicates that as the number of protons increases inside the nucleus more and more neutrons are needed to minimize the proton-proton repulsion and thereby to add to nuclear stability. Neutrons therefore serve as binding martial inside the nucleus. The way an unstable nucleus disintegrate will be resided by its position with respect to the actual n/p plot of nuclei. When the isotope located above this actual n/p plot it is too high an n/p ratio, and when it is located below the plot it is too low in n/p ratio. In either case the unstable nucleus should decay so as to approach the actual n/p plot. We now discuss the two cases of decay. An isotopes with too many neutrons in the nucleus ( that is, with more neutrons than it need for stability) can attain greater nuclear stability if one of the neutrons decay to proton. Such a disintegration leads to ejection of an electron from inside the nucleus. Thus beta ray emission will occur whenever the n/p ratio is higher then the n/p value expected for stability. This is almost always the case when the mass number of the radioactive isotopes is greater then the average atomic weight of the element. A nucleus deficient in neutrons will tend to attain nuclear stability by converting one of its proton to a neutron and this will be achieved either by the emission of a positron or by the capture of an electron. Such Decay occurs with a radioactive isotope whose mass number is less than the average atomic weight of the element. Positron emission occurs with light isotopes of the elements of low atomic number. Orbital electron capture occurs with too light isotopes ( too low n/p) of the elements of relatively high atomic number. For such elements the nucleus captures an electron from the nearest orbital ( K shell; n = 1) and thus changes one of its protons to a neutron. Among the heaviest nuclei the total proton-proton repulsion is so large that the binding effect of neutron is not enough to lead to a stable non radioactive isotope. For such nuclei alpha particle emission is the common mode of decay. In Practice radioactivity is expressed in terms of the number of disintegration per second. One gram of Radium undergoes about 3.7 × 10¹⁰ disintegrations per second. The quantity of 3.7 × 10¹⁰ disintegrations per second is called curie, which is the older unit of radioactivity. Milicurie and microcurie respectively corresponds to 3.7×10⁷ and 3.7×10⁴ disintegration per second. On this basis, radioactivity of radium is 1 curie per gram. 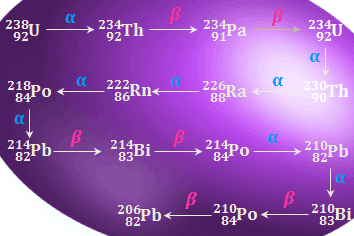 Phosphorus-32, a beta - emitter, has an activity of 50 milicuries per gram. This means that for every gram of phosphorus-32 in some material containing this species, there are 50 × 3.7 × 10⁷ disintegrations taking place per second. 1 disintegration per second is called becquerel(Bq), it is the S.I. unit of radioactivity. Another practical unit of radioactivity is Rutherford(Rd). When an Alpha particle ejected from within the nucleus the mother element loss two units of atomic number and four units of mass number. Thus, if a radioactive element with mass number M and atomic number Z ejected a alpha particle the new born element has mass number = (M - 4) and atomic number = (Z - 2). When a beta particle is emitted from the nucleus, the daughter element nucleus has an atomic number one unit greater than that of the mother element nucleus. Thus, if a radioactive element with mass number M and atomic number Z ejected a beta particle the new born element has mass number same and atomic number = (Z + 1). We have just seen that the radioactive elements continue to undergo successive disintegration till the daughter elements becomes stable, non- radioactive isotopes of lead. The mother element along-with all the daughter elements down to the stable isotope of lead is called a radioactive disintegration series. The mass number of all the above disintegration products are given by (4n +2) where n = 59 for Uranium - 238. This disintegration series is known as (4n + 2) series. The (4n+3) series (n=an integer) starts with Uranium - 235(n=58) and end with the stable isotope Lead - 207(n=51). 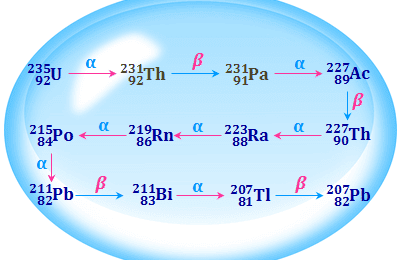 The (4n) series (n=an integer) starts with Thorium - 232(n=58) and end with the stable isotope Lead - 208(n=52). When an alpha particle is emitted in a radioactive disintegration step, the product is displaced two places to the left in the Periodic Table but the emission of a beta particle results in a displacement of the product to one place to the right. 79Au197 is non radioactive but 88Ra226 is Radioactive-Why? The number of neutron in gold(Au) is 118 and proton is 79. Which is lees then 1.5 thus Au-197 is stable. 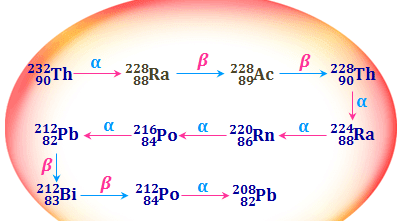 But in Ra - 226 the number of Neutrons(n) = 138 and number of proton(p) = 88. So n/p ratio = 1.57. Which of the following elements are beta emitter and why? (i) 6C12 and 6C14 (ii) 53I127 and 53I133. The n/p ratio for stable carbon C-12 is 1.0(6n + 6p) but that for C - 14 is 1.3 (8n + 6p). It will predict that carbon -14 will be radioactive and will emit beta rays. Similarly the n/p ratio of the stable Iodine-127 is 1.4 (74n + 53p). For Iodine-133 the n/p ratio equals 1.5 (80n + 53p) and it is again predicted to the beta emitter. If a radioactive element x number disintegration per second. Express the radioactivity of this element in Curie. 3.7 × 10¹⁰ disintegrations per second = 1 curie . Thus x number of disintegration per second = x/(3.7 × 10¹⁰) Curie.